Home / Open Hours at the Shelter! We now have Open Hours at the CCC! Every Saturday from 10-12, the shelter will be open to the public to come visit adoptable cats, talk with volunteers, and tour the shelter. 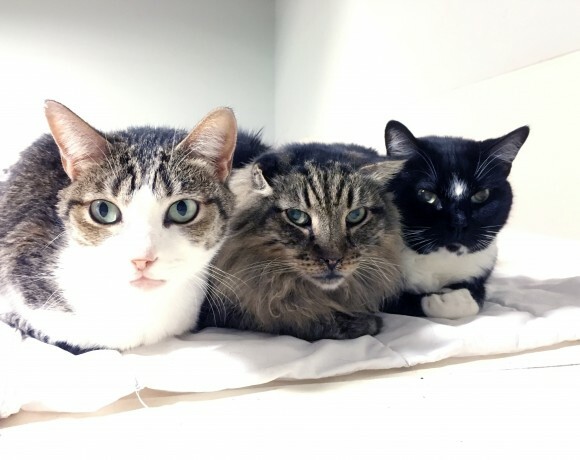 Come visit our adoptable cats—we have lots of them who are looking for furrever home (like Newton, Paddy Boy, and Parker in the pictures below!) They would love to meet you! Come socialize with our cats. They love to have their fur brushed and play with toys. If you have older children who are gentle and kind to our cats, this is a great way to get them exposed to cat care! Visit with our volunteers—we are a wealth of cat knowledge! Ask about kittens! Although we won’t have our kittens at the shelter tomorrow, we have MANY kittens available for adoption and one of our amazing volunteers can give you any information you’d like. Stop by for 5 minutes, or stop by for 2 hours! All are welcome—we hope to see you there! *Please Note: If you have questions about surrendering a cat, please email or call us ahead of time. We are unfortunately not equipped to be able to accept cats during open hours. Moonlight MeowsOpen Hours at the Shelter!